Picket fences, with their repeating rhythms, usually lend a sense of orderliness to a yard. This aging, no longer tidy fence, has gone in a different direction. You could see it as an example of Wabi Sabi, the elusive Japanese concept that puts value on imperfection, age and wear. The rhythmic flow of the pickets is still there, but the irregularities of the worn surfaces make it much more interesting. 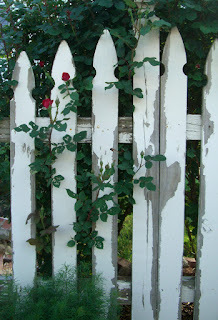 The neighbors may disagree, but this fence, with its barely-contained roses, has a certain charm.